"I am the greatest fighter in all history." Muhammad Ali emerged as "The Greatest" boxing champ of his day in the 1960s, moving from Olympic achievement to the professional arena, winning the Heavyweight title from Sonny Liston and defending it against numerous challengers. He converted to Islam, changing his name from Cassius Clay to Muhammad Ali; his subsequent refusal on religious grounds to enter the army during the Vietnam conflict cost him his title, but after three and a half years of enforced retirement, Ali returned to the ring and took it back from Joe Frazier in a pair of legendary fights. Ali also established himself early on as a colorful personality and shameless self-promoter, never at a loss for words or bravado, predicting each opponent's defeat with rhyming, humorous putdowns. Ali retired in 1981, and today struggles with Parkinson's disease. But in the nineteen-sixties and early seventies, his lightning-quick fighting style made him an unbeatable opponent, while his macho, good-natured wit made him a national celebrity, even among non-fans. 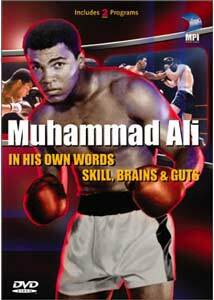 MPI's Muhammad Ali: In His Own Words / Skill, Brains & Guts DVD presents two separate documentaries about the boxer while in his prime, assembled from archival fight footage and television interview material. The 39-minute In His Own Words, created in 1998, focuses on Ali's verbal pyrotechnics, compiling a number of colorful speeches and interviews from before and after each of his major fights. It also includes a few segments from his later life, depicting his struggles with his medical condition and his affecting lighting of the torch at the 1996 Olympics. The feature-length 87-minute Skill, Brains & Guts!, produced in 1975, covers some of the same historical ground, but also features plentiful fight footage of Ali on his feet and moving. His style at its peak is a marvel to behold—dodging, weaving, and hitting quickly and precisely, Ali makes his opponents look like average bystanders instead of professional boxers. Unfortunately, Ali's famous fight against George Foreman is represented only by still photographs, and the filmmakers' clumsy, low-budget editing leaves much to be desired. But the footage of Ali's undeniable pugilistic prowess in action makes this documentary worth a viewing. Both films suffer from a certain distance—neither gets very close to Ali, his family or his colleagues—and there's some inevitable redundancy between the two, which utilize some of the same source material. The documentaries rely exclusively on archival footage and photographs, glued together by bridging narration and Ali's proclamations as captured by the camera. As a result, neither provides much insight into the man himself—they're simply compilations of existing material, with no additional analysis or discussion of Ali's career or personality. It's great to see "The Greatest" talkin	trainin	and takin' 'em down, and MPI's Muhammad Ali disc is a worthwhile historical package on that basis. But there isn't much else to see here—dedicated Ali fans won't learn much, and neither will casual viewers. Image Transfer Review: The two Muhammad Ali documentaries are presented in 1.33:1 full-frame format, appropriate to the 16mm fight films and television interview footage from which both productions are constructed. In His Own Words was edited on video, introducing 3:2 pulldown and some scan-line flicker, while the older Skill, Brains & Guts! originates on film, though the editing is fairly clumsy with visible splices and jump cuts. Both are highly dependent on the limited quality of their component materials, and it's probably not reasonable to expect a stellar-quality presentation; both are also plagued by scratches, flecks and frame damage. Unfortunately, even given lowered expectations, neither production looks very good on MPI's single-layer DVD. Excessive edge enhancement abounds, becoming particularly distracting around the ropes of the "squared circle", and both films look soft, with poor detail and faded colors. Worst of all, overcompression on Skill, Brains & Guts! produces artifacts I haven't seen since the early days of digital video, with heavy color banding, "posterization" and blocking that recall the primitive days of Cinepak and the Sega CD. Cramming more than two hours of grainy, challenging material onto a single DVD layer is rarely advisable, and MPI's Muhammad Ali provides a dramatic negative example. It just isn't up to DVD standards, and in some ways looks worse than a good-quality analog VHS videotape. Audio Transfer Review: Both films are presented in Dolby Digital 2.0 monaural format, ProLogic-decoded to the center speaker. Audio quality is limited primarily by the source materials, some of which sound extremely clipped and noisy due to recording technology limitations and environmental circumstances. The voice-over on the newer In His Own Words documentary sounds clear enough, but even the narration on Skill, Brains & Guts! sounds narrow and flat, and careless editing produces a number of splice-induced "pops" on its soundtrack. The digital transfer presents the low-quality audio faithfully enough, but none of it sounds great. Extras Review: MPI's Muhammad Ali DVD features full-motion menus, 22 text chapter stops, and optional English subtitles. The only other extra is an odd little Ali Featurette, basically a collection of stills and video clips, animated using simple ADO effects over a generic instrumental rendition of Eye of the Tiger. It adds nothing substantial to the content, and seems an odd inclusion given the disc's crippling single-layer space limitations. MPI's Muhammad Ali disc contains two archival documentaries, sure to be of some interest to boxing fans. But the films provide little insight into the man or his career, and the disc's transfer quality leaves much to be desired. Not recommended.